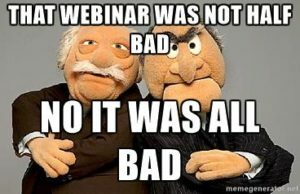 7 Guidelines to Make Your Webinars Awesome! Webinars continue to be one of the most effective marketing channels in the B2B space. Done right, they can help to establish [and cement] your position as a Subject Matter Expert (SME), define your competitive advantage in the marketplace, build awareness for your firm and – maybe most importantly – generate and nurture qualified sales leads. Why I left this webinar after just 10 minutes! Using webinars for marketing? Follow these 4 guidelines. 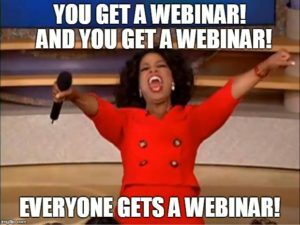 Webinars can help you achieve a number of marketing objectives… building awareness for your firm, positioning you (the presenter) as a Subject Matter Expert and, of course, generating sales leads. We like webinars so much, we started our own program this year. And as we’ve gotten into this program, we’ve learned 4 key lessons that can be helpful to anyone with webinars in their marketing & sales plan.